ImageLab allows the user to create up to 32 image masks which can be used, for example, to exclude a particular class of pixels from further calculations. The image mask can be generated algorithmically and edited manually by using the mask editor (c.f. the section on masking pixels). In order to edit a mask select an already existing mask or create a new one. After selecting a particular mask the tools needed to edit will be enabled. The mask generator uses a background image which may be created either by visualizing the total intensity of the image, the variance in the image, the maximum intensities, or the negative values. The background image has no influence on the mask, it is solely intended to provide better orientation for setting the masked pixels. Hint: The calculation of the background image is prepared to be executed in parallel on multi-core processors. The increase in speed corresponds roughly to the number of CPU cores in your system (a four core system will be faster by a factor of 4). You can fine-tune the assigned processing power in the preferences of the program (see the option Allowed CPU Usage in Multiprocessor Systems). 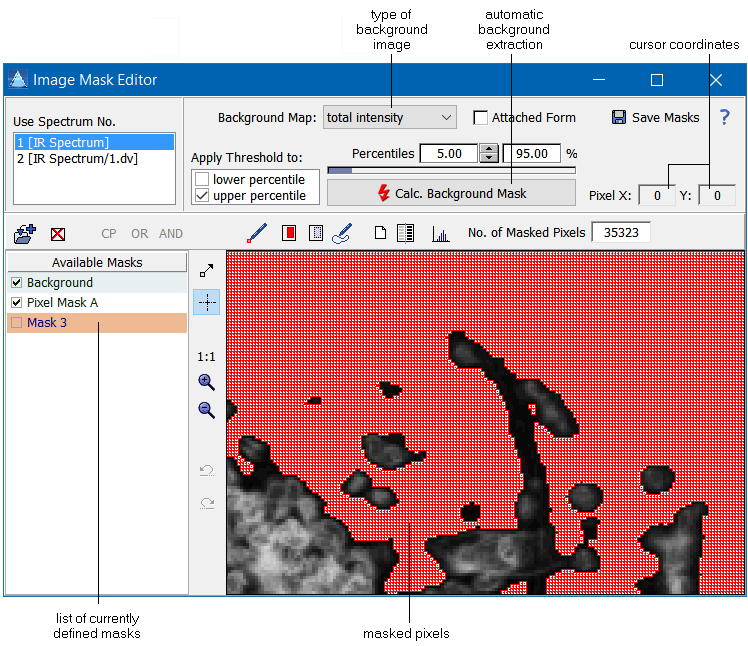 Calculate Background Mask This tool enables the user to test all pixels for a significant signal contribution. Pixels which do not contribute a significant signal are masked. The parameter for the significance of the pixel can be set by the threshold control. Please note that the automatic background extraction may be impossible in some cases (due to the intensity distribution of the pixels) - for details, see the algorithm of the automatic background extraction. In this case ImageLab will issue a warning message before proceeding to calculate the background image. Save Masks This button saves the current masks without saving the binary data cube. Sometimes you change your data (i.e. by spatial filtering) in order to be able to create smoother masks. Saving the data would store the new mask but would at the same time destroy the original data replacing it by the smoothed version. In order to avoid such situations you can save the mask without storing the binary data. Thus, after reloading the data the original data will be restored while the new mask remains available. Masking Pencil This tool allows you to set or reset the mask of individual pixels by simply clicking them. Masking a Rectangular Area In order to mask a rectangular area, click and drag the mouse. The rectangle shown when dragging the mouse will mask the corresponding pixels entirely when releasing the mouse button. Clearing a Rectangular Area Same as above, but resetting the mask pixels in the rectangular area. Masking a Polygonal Area In order to mask the pixels within a polygonal area click the first vertex of the intended polygon and then ctrl-click all other vertices. The final vertex has to be clicked without the control key pressed. Afterwards the polygon is filled by masked pixels. Clear the Mask Resets all mask pixels. Inverting the Mask This command inverts the current mask. Mask by Intensity This tool allows you to assign mask pixels which are corresponding to a particular intensity range in a particular layer of the image hypercube. See the section Signal Distribution Analyser for details. Panning the Visible Area You can pan the visible area of the mask by dragging it with the mouse. Cursor Only The switches off all mouse activities. Only he cursor coordinates are displayed. Zoom 1:1 Set the zoom state such that the individual pixels are clearly visible. Redo The mask editor remembers the last seven changes done to a mask, enabling you to undo or redo recent changes. Add a New Mask Create a new mask. You have to enter a name of the new mask and click OK to create it. Delete a Mask Delete the selected mask (after confirmation). Copy a Mask In order to copy a mask you have first to tick off the source mask and select (highlight) the destination map. Next click the copy button to copy the source to the destination. Logical OR The OR button combines all masks which are ticked off by a logical OR and writes the result into the selected (highlighted) mask. Logical AND The AND button combines all masks which are ticked off by a logical AND and writes the result into the selected (highlighted) mask.